The Special Inspector General for Afghanistan Reconstruction (SIGAR) has just released its quarterly report on Afghanistan to congress. The special project's report contains a list of reports that are highly concerning about Afghanistan's future. Among the many of concerns on the country is its economic prospect. Giving the fact that the country has been in turmoil for decades, long enough that the infrastructure eventually extirpated, it is considerably hard to measure Afghanistan’s economy growth on a global economic index, but there are some reports that give a good estimate of how has Afghanistan’s economy been doing in post-Taliban era. 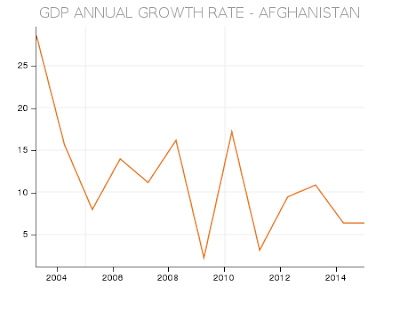 Since 2002, the slowest growth that Afghanistan economy has experienced was in 2014. According to the CIA World Factbook, the highest GDP growth was recorded 14% in 2012. Then, in 2013, it surprisingly experienced a drastic decline which was recorded 3.9%. In 2014, it dropped lower to 1.3%, and in 2015, it even went steeper to 1%, which is lowest than it has ever exited. But now there is a report that came out just yesterday indicating Afghanistan’s GDP growth may drop even lower. Considering all these facts about Afghanistan's economy, it is safe to say that Afghanistan's economy in 2016 may not change if there is not any improvement in its current political instability and violence that is overwhelmingly increasing throughout the country. Based on SIGAR report, Afghanistan has become more dangerous today than the years before. It reports that the Taliban now have control more territory than at any time since 2001. It estimates that roughly 71.7% of the country's districts are under Afghan government control, or influence. In the end, the negative yield curve in Afghanistan economy could only change if there would be any outside help not only to fragile economy, but as well as to its security.